The Roscommon legend says they should look to bolster their resources by signing up players who have ties to the county. 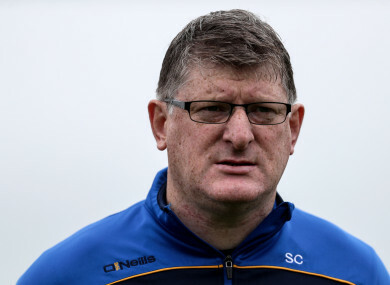 FORMER ROSCOMMON GOALKEEPER Shane Curran believes the county need to bring in outside players if they’re to compete at the elite level in Gaelic football. The Rossies suffered their second defeat of the Super 8s at the weekend to Donegal, a result which ended their chances of progressing to the All-Ireland semi-finals. Curran, who took charge of the Roscommon U20s this year, says they need to start thinking outside the box to help attract a better calibre of player into the county set-up. “What we really need to concentrate on as a county now is how we can resource our players better,” he told Damian Lawlor on the RTE GAA Podcast. “Maybe also how we can attract players in. “This is probably a controversial point, but if we want to get to the next level, the Roscommons of this world cannot compete with the Tyrones, Dublins and Galways without being able to attract outside players to play for our county. “Through work operations, the public or private enterprise, that’s the next level I think we need to go to if we’re going to be able to be competitive at a very, very elite level. “It’s nothing new. 30 years ago Cork done it with Larry Tompkins and Shea Fahy. Dublin are doing it today but in a different way in that people are migrating day after day, week after week, month after month, year after year into the city. “The city is sprawled out. Most of the players playing club football in Dublin, their mothers and fathers are from country areas. A lot of the players playing for Dublin in the next 10 years, their mothers and fathers will be from country areas. “Paul Mannion’s father, for example, is from Roscommon or the border. His cousin (Shane Mannion) plays for Roscommon. There are many others. I don’t know the background to them all. Curran says Roscommon should look to bolster their resources by signing up players who have ties to the county. “Movement of players is not new, it’s how you attract them is the next thing for teams like us in Roscommon who want to go to the next level. There’s no ambiguity in it, it’s very clear. You can work here you can work there, there’s (parentage) rules there as well. And we need to be really clear about ambition and moving forward. “Can we do it with a 60,000 population? It’s impossible. Can you do it if you look outside the box? I think, yes you can. The template has been there in the past. Dublin are doing it on a different level and it’s kind of like a blanket over it, there’s a cover around it, a shield around it. That’s the way life goes. People move. Email “Shane Curran: Time for Roscommon to 'attract outside players to play for our county'”. Feedback on “Shane Curran: Time for Roscommon to 'attract outside players to play for our county'”.